Did you ever eat those Mothers Circus Animal Cookies as a kid? Those addicting little pink and white cookies were a staple at my house. 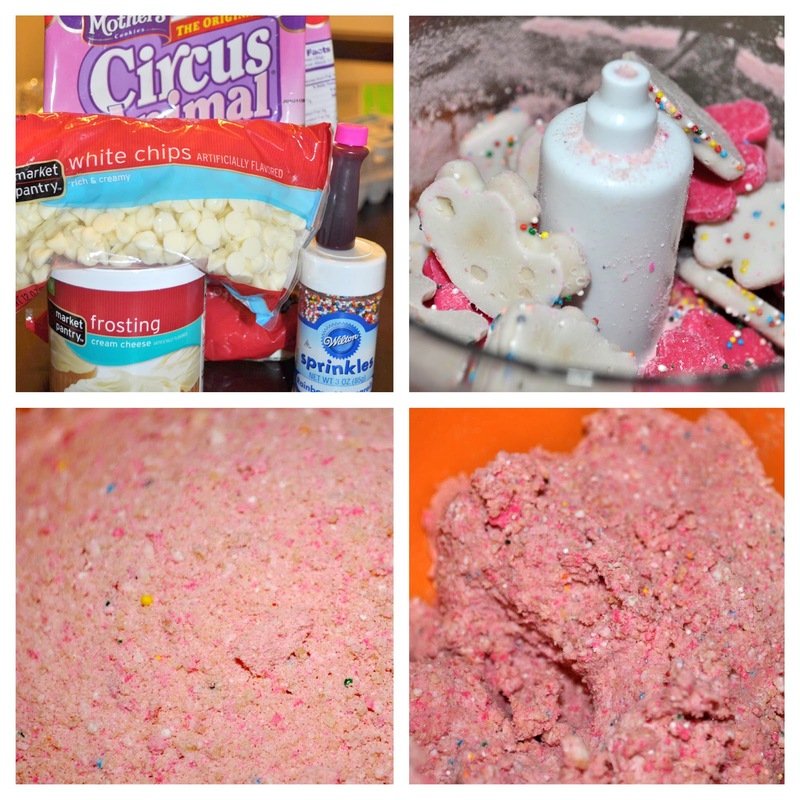 I whipped up these Circus Animal Cookie Truffles a couple weeks ago and they were an absolute hit with my friends! So, I'm not gonna lie. A treat like this is a little bit crazy. So crazy that it could have only been created by an sweet genius The Domestic Rebel. The process is a little lengthy since you need to let the cookie balls freeze for three hours and melt your white chocolate down but it's worth it. The most fun part of this whole thing was throwing those Circus Animals in the food processor and watching those suckers spin. Sounds morbid I know, but I was that kid (actually I'm that adult) who finds joy in biting the heads off my gummy bears. After a good spin the crumbs were combined with some cream cheese frosting to get everything all good and coated so they can be shaped into cookie balls. Freeze your cookie balls for 3 hours then dip them in the white chocolate you melted. Make sure you melt your white chocolate to a runny consistency this will make the coating process a LOT easier. Reserve half your melted chocolate and dye it Circus Animal Cookie Pink. Set your dipped truffles on some wax paper and add your rainbow nonpareils while the coating is still wet! I love how these sweets end up looking like the original thing with their pink and white coating all the way down to the rainbow nonpareils on top. 1. Line a rimmed baking sheet with foil and set aside. Meanwhile, in a food processor, grind the cookies (about a cup at a time–work in batches) until finely ground, coarse crumbs. Pour all the ground cookies into a large bowl. 2. Once cookies are ground, spoon in the half can of cream cheese icing. Using your clean hands or a spoon, mix together the crumbs and frosting until thoroughly combined. 3. Begin portioning the crumb mixture into inch-sized balls (I used a small cookie dough scoop) and place the balls onto the foil-lined baking sheet. Repeat until all the mixture is used up. 4. Freeze the truffles for about 3 hours or until completely frozen and solid. While they’re freezing, prepare your white chocolate according to package directions until smooth and melted. Pour half that mixture into a separate bowl, and using your pink coloring, tint one of the bowls a pretty pink shade. 5. 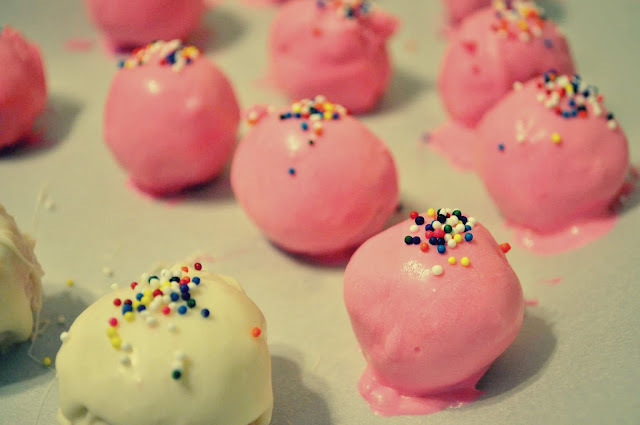 Dip half the batch of truffles into the white chocolate, and the other half into the pink chocolate. I used a fork to coat all sides of the truffles, then allowed the excess to drip off the bottom before gently placing each dipped truffle back onto the foil-lined sheet. While still wet, sprinkle the truffle tops with the rainbow nonpareils. 6. Allow all the truffles to harden and set, about 20 minutes in the fridge. Store leftover truffles airtight for about 2-3 days at room temperature, or a week in the freezer–just allow them to come to room temperature before eating them that way. That sounds just too yummy! These sound like such fun! My three year old loves those cookies…mostly because they have sprinkles and come in pink. That sounds really good! I am havinf a sleepover for my daughter soon and this would be a perfect treat for them!!! I'm Jennice visiting from SITS!!! Happy SITS Day! wow, those look so mighty cute and tasty. That's cute how you put storage directions...as if these things would last long enough to be stored!! Yum!! Looks awesome! My kids would love these. Happy SITS day! Happy SITS Day! These look absolutely delicious. Awesome! Sounds like fun to make too. Happy SITS Day. Those look so pretty and tasty! I am definitely going to try them out!!! Happy SITS Day to you!!!! I NEED to try these. They look so amazing! Visiting from SITS! I have never heard of these cookies, which is too bad, because they sound delicious! wow these sound amazing and I have pinned them for late :D thanks for sharing! Happy SITS day! Those look good! Visiting from SITS! I also graduated from UC Davis in communications, such a small world. I look forward to following your blog!